It’s easy enough to throw a concoction together for a remedy at home but the real question is not just whether it works. The question is: what do people like to use and why? From solid fats to liquid oils, there are plenty of household items that work in hair. Here are some homemade hair treatments to use (and not use) from users around the globe. Although you can find many homemade hair treatments for all kinds of hair, very few top the list in the best of the best. The top three user picks are: eggs, oils and vegetable shortening. Many people use mayonnaise for their hair and seem to love the results. But broken down into its simplest form, mayo is mostly whipped egg and oil. If you hate the smell of mayo but can tolerate the smell of egg, break down the product wall and go with this simple homemade hair treatment. Egg and oil is a great combo but even though egg is a user pick as one of many homemade hair treatments, you should be careful as to how you use it. Raw egg always has the chance of containing salmonella, so you should properly disinfect when cleaning up after using it. Remember to choose eggs from a source you trust. Also, never wash out the remedy in a shower with really hot water. Otherwise, you’ll end up with scrambled eggs stuck in your hair! There are a variety of oils you can use in your hair. Olive oil, almond oil, castor oil and the solid or melted (liquid) form of coconut oil are all top user picks. And it doesn’t matter what type of hair you have either. The oil for homemade hair treatments is used as a treatment and washed out at the end just like a regular shampoo or conditioner. To use any kind of oil, make sure your hair is wet and well-conditioned before applying. You can even heat the oil a little bit and work from the roots to the tips. Users also love to mix and match oils including jojoba and avocado oils as well as other products such as aloe vera for their unique hair types. Vegetable shortening, such as Crisco, contains the vitamins and minerals (including antioxidants) of some of the more popular liquid oils for homemade hair treatments. If you have ever made a pie crust, you know it’s usually an opaque, white and solid substance akin to the feel of butter or lard. This means the product should be whipped into a softer substance for easier application. Like olive oil and other liquid oils, vegetable shortening can be used as a sealant and emollient for hair. The fatty acids and vitamin E it contains are perfect for strengthening even the thinnest of hair. As long as you whip it into a softer substance and add honey or some sweeter smelling essential oils, your hair will sop up the vegetable shortening love without the bad odor. As many homemade hair treatments as there are, there are many more that users know are myths. For instance, lemon juice not only does little to lighten hair but it also dries and damages hair due to the high acid content. Smashing fruit into your hair does little to help your hair, especially since it’s in the least concentrated form. The best way to get those nutrients into your hair is to eat the banana, not to wear it. Lastly, if you think an homemade hair treatment will solve the problem but it doesn’t, consult a hair care professional such as your stylist for more information on at-home remedies. A good stylist will know what to use and how to use it, even if it’s as simple as an homemade hair treatment. 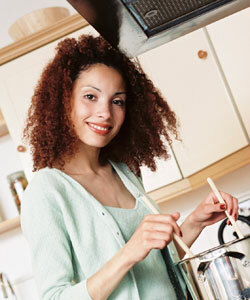 Which homemade hair mixes do you love to treat your curls to?